Alum Joseph Conyers, age 36, grew up in the small southern city of Savannah, Georgia. He performed on From the Top in 1999 as part of our second pilot program. We reached out to him recently to see what he’s up to in 2017. 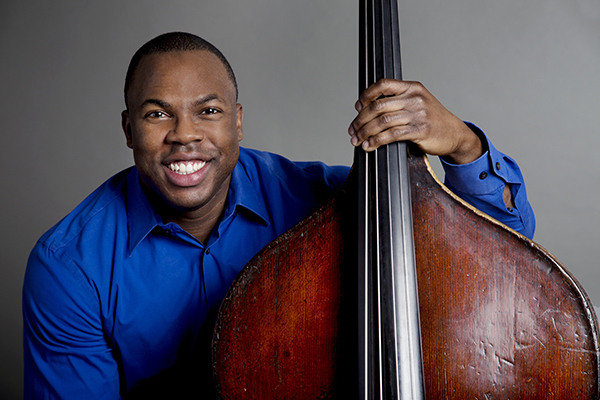 18 years after performing on From the Top, he now serves as assistant principal bass player of the Philadelphia Orchestra, Executive Director of Project 440 helping young musicians practice community engagement, Music Director of Philadelphia’s All City High School Orchestra, bass teacher for a full studio of students, and guest performer with many orchestras nationwide. Savannah’s music community was so small that there were not enough performers to make up a youth orchestra. Joseph, who also goes by Joe, was the only bass player at that time, and performed with a local civic orchestra made up of performers of all ages. “I felt a little isolated in Savannah,” he said. “Then I had a chance to attend the Brevard Music Festival in North Carolina, and Boston University Tanglewood Institute (BUTI).” That was when Joe saw another side of the music world – one in which numerous kids his age performed at a high level. Joe’s show was in Boston. It was his first trip there and one of the first times he saw snow. Before From the Top, Joe encountered quite a few naysayers claiming he was crazy for considering the bass as a career, as they were sure that he would never find success. But he proved them wrong. Not long after his radio performance, Joe was accepted at the Curtis Institute of Music in Philadelphia where he received his bachelor’s degree after studying with two celebrated bass players – Harold Robinson, principal bass of The Philadelphia Orchestra, and double bass soloist Edgar Meyer. After performing with the Atlanta Symphony and as principal bass of the Grand Rapids Symphony, as well as four summers as a member of the Santa Fe Opera Orchestra, he received his position with the Philadelphia Orchestra. He also won Second Prize at the 2004 Sphinx Competition in Detroit and many other prizes and awards. He has performed with multiple orchestras as a soloist, including being featured with the Grand Rapids Symphony in a concerto titled Prayers of Rain and Wind (by John B. Hedges) which was commissioned by that ensemble and written specifically for Joseph. Joe and two fellow Savannah musicians founded the Savannah Chamber Players in Georgia in 2007. When he joined The Philadelphia Orchestra, that group, now called Project 440, moved to Philadelphia where he has continued to pour tremendous effort into its mission. Why is it called Project 440? The number 440 is equal to 440 Hz, which equals the pitch “A.” This is the same “A” used by the oboe to tune the orchestra. Just as that note is the first pitch heard at every symphonic concert, so Joe and his colleagues want the young musicians they work with to be leaders in their communities through music. What does Project 440 do? The goal is to bring young musicians into their community, instruments in hand, not just to play but also to interact with their audiences in a way that would truly engage both the musicians and the community members. 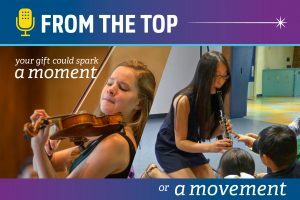 When the organization moved to Philadelphia, Joseph and his colleagues shifted the focus to teaching young musicians the skills they need to engage their communities with interactive performances, as well as the skills they would personally need to be prepared for careers in the 21st century. “We use music as a tool,” said Joe. “It’s about learning life skills such as teamwork, social entrepreneurship, and problem-solving, all of which are needed to be successful in the real world”. Project 440, like From the Top’s education programs, involves community engagement and outreach work. According to Joe, “Musicians have a gift to share with the community.” Project 440’s job is to train them to do that. No longer that young kid from Savannah cautioned about pursuing a career playing the bass, Joseph Conyers is now an established and celebrated musician, as well as an optimistic and upbeat mentor to many, who is giving back in the same way that others, including From the Top, have given to him. Kudos to you, Joe!